Resplendent in red lacquer trim with blue lighting details, the Asus G71V is a smart looking machine boasting a powerful 2.53GHz Core 2 Extreme processor, Blu-ray Disc drive and nVidia GeForce 9700M graphics card. 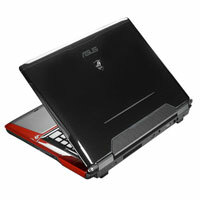 The Asus G71V is a relatively well-rounded entertainment laptop, capable of showing Blu-ray films at full high-definition quality, as well as playing modern 3D games. It has vast amounts of storage, and good raw performance thanks to four 2.53GHz processor cores. When you place yourself and this notebook in any comfortable position you prefer, you will notice that Vista simply “flies” and applications react almost instantly at your commands. Unfortunately gaming performances aren’t on same level as rest of this notebook. Simply put, native resolution is too much for nVIDIA 9700GT graphics card and this will result in usage of middle of low settings in most contemporary games. If you don’t mind playing games with settings not set at “High” (or “Highest”) than this can be model for you. If you want to play games on “High” and enjoy in best gaming experience on notebook then you must wait a little bit more for some of models that will have slightly slower CPU and better graphics card. The ASUS G71G-X1 is the gaming version of their new G71 series desktop replacements. This means the system lacks features such as the Blu-ray drive found on the A versions but instead features a more powerful GeForce 9800M mobile graphics. Even though it is performance oriented with the high speed Core 2 Duo, ASUS decided to use DDR2 memory to cut down on costs but it also holds back the system in memory intensice applications. Overall, a good system for computer gaming but might not be as good for general purpose computing. Good job we found the Asus G71 online at a price substantially cheaper than the SRP of two grand. Despite its size, it does look quite lovely too – although the red case flashes and strobing LED trim clashes with the relatively restrained keyboard and touchpad. Forget Alienware and its overhyped, overpriced machines - there’s a new kid on the block. Okay, so ASUS isn’t exactly a new company, but the Taiwan-based manufacturer best known for its über-quality peripherals (motherboards, graphics cards, and the like) now wants to dominate the high-end gaming space. Substance, style & performance, the G71V will revolutionise your mobile gaming experience. NVIDIA GeForce 9700M GT: Successor of the 8700M GT and technically a higher clocked 9600M GT. Improved video engine for decoding HD videos (PureVideo HD - VP2), HybridPower, CUDA, and PhysX support. Non demanding games should be playable with these graphics cards. » Further information can be found in our Comparison of Mobile Graphics Cards and the corresponding Benchmark List.